Infusionsoft is a well known program for customer information management and marketing automation, with many small businesses relying on it to not only keep track of client records, but also convert leads via nurturing campaigns. 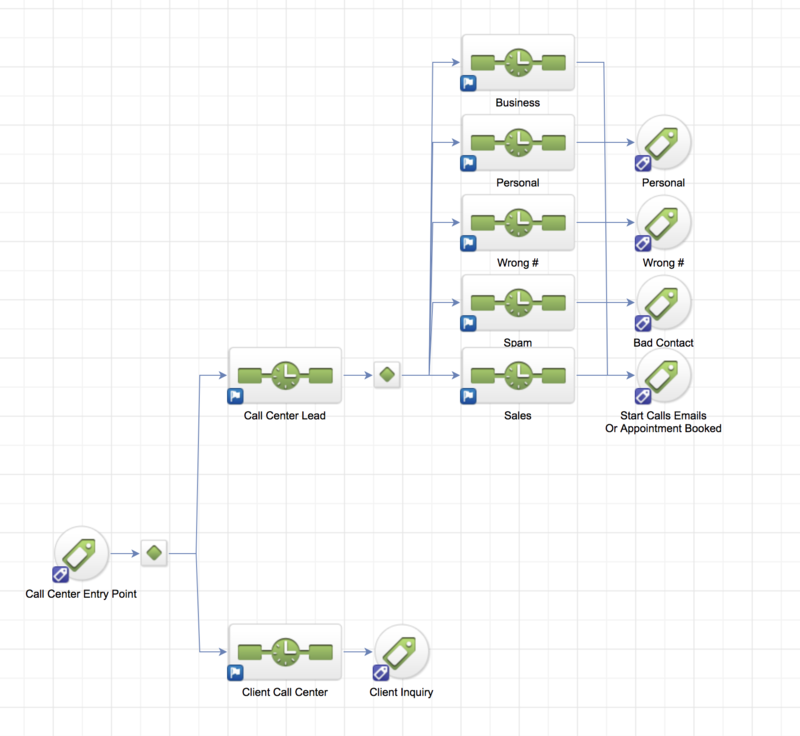 Since Smith.ai receptionists often field calls from both potential and existing clients, it was important for us to enable a connection between our system and Infusionsoft, so small businesses using Smith.ai can keep their data in sync. Now, when calls are completed, contact information is automatically updated and next steps happen without delay. For example, you can instantly assign new leads to an email marketing campaign geared towards converting them into new clients. The integration also eliminates time-consuming copy-and-paste grunt work, and the human data-entry errors that inevitably result from it. These automations don't leave you in the dark, however — after every call, you'll still receive an email or text message with a post-call summary, along with a daily report that summarizes all the calls your receptionists handled that day. Smith.ai connects to a webhook to a Zapier catch-all endpoint. This endpoint connects to your Infusionsoft account. The webhook allows us to pass all of the call information into your records, including the caller's name, email, phone number, and address, as well as the call summary, disposition, priority, and call type (e.g., personal, business, spam, or wrong number). 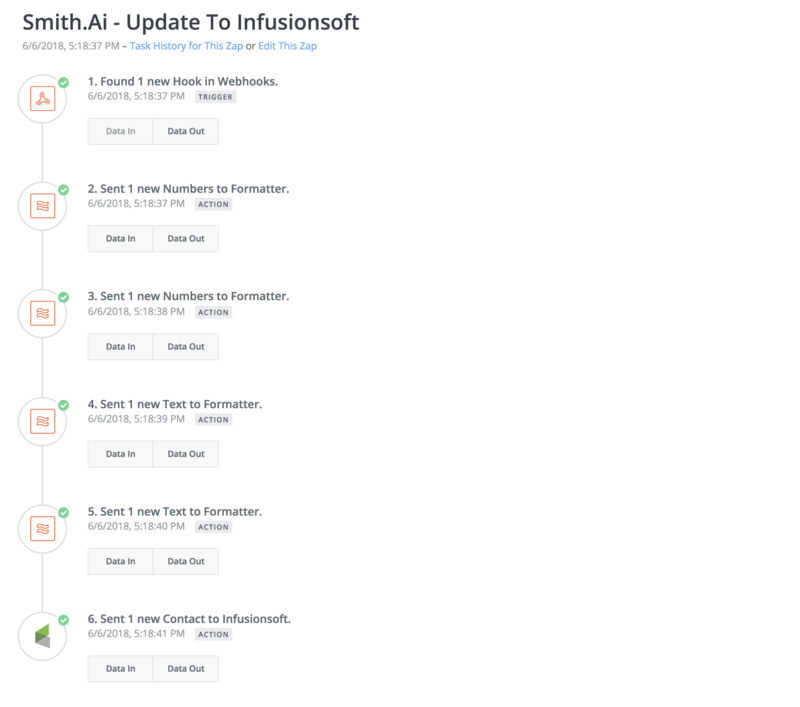 Unlike most of our other integrations, the Smith.ai integration with Infusionsoft requires working with an Infusionsoft certified consultant. If you already work with an Infusionsoft consultant: Email us at support@smith.ai with your consultant cc'ed, and we will work with them to connect your accounts on both platforms. If you don't yet work with an Infusionsoft consultant: We recommend Kelsey Bratcher at Hired Gun Solutions, the same person who implemented the integration in the example above. Kelsey can be reached at kelsey@hiredgunsolutions.com. Please cc support@smith.ai when you reach out to him.